Game description: A collection of 3 games (on one disc) from one of SNK's most popular fighting game series FATAL FURY. 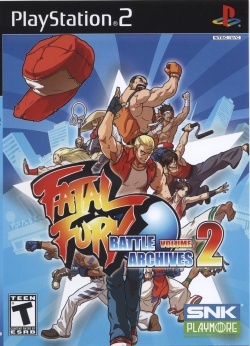 The titles included are: Real Bout Fatal Fury, Real Bout Fatal Fury Special and Real Bout Fatal Fury 2: The Newcomers. The games are known for their hand-drawn animation and character designs containing visual flair and personality with 2D gameplay that is fast, furious and addictive. This page was last edited on 4 April 2017, at 22:38.